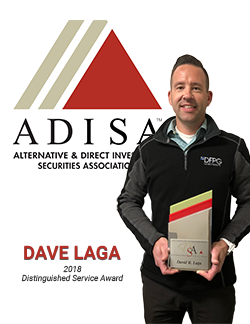 According to ADISA, the Distinguished Service Award is presented to individuals and companies who have provided exceptional service to ADISA, the alternative investments industry, and the overall community. In addition to being past president at ADISA, Bendix received the 2014 ACE Award, which is ADISA’s lifetime achievement award. DFPG Investments received ADISA’s 2017 President’s Award, which is given to an individual or organization that has made outstanding contributions in their chosen field, by service in local, state or national affairs, or in support of the advancement and continued excellence of ADISA.